Old fashioned, low tech fun for all the family. Colouring is fun and we have something for all ages and abilities to keep you entertained all year. Well, we like to think we’re reinventing the fridge door. The outside, that is. Since the invention of the refrigerator, they have been home to souvenir magnets, shopping lists and of course, children’s artwork. Unfortunately, in the modern home there are precious few places where children can see their handiwork displayed and enjoyed. With this in mind, our aim is simple – to provide a range of products for children (and adults!) to showcase their creativity within the home environment. We’re working to create exciting new design collections for our wallpapers, borders and sticker packs. Whichever you choose, you’ll be happy to know that we only use the highest-quality materials and manufacture every product here in the UK. If you believe that you don’t need a three pin-plug to have fun, then you’ll love FunWall and our range of products. 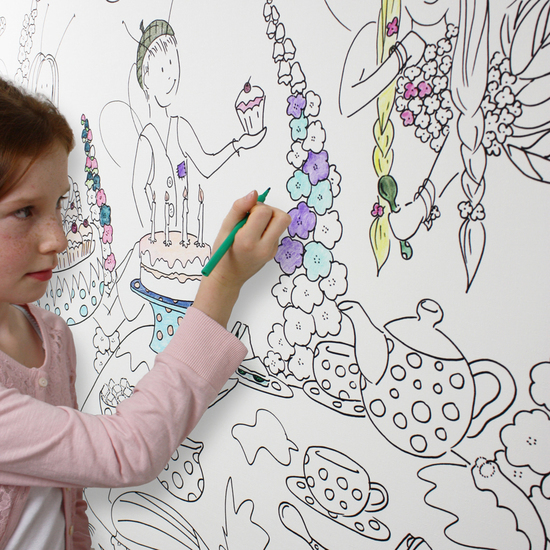 Our ‘junior’ range is ideal for younger children or beginners and our standard design collections provide hours of colouring fun for older children and adults. Use pencils, felt-tips or paints to create your own unique masterpiece.